1. Preheat the oven to 200°C, gas mark 6. Place the rice and turmeric in a casserole dish and pour over 300ml boiling water and season. Cover with a tight-fitting lid and place in the oven for 10 minutes. 2. Meanwhile, fry the beef and onion for 5 minutes to brown. Stir in the biryani sauce and cook for a further 5 minutes. Stir in the peas and ¾ of the coriander. Spoon on top of the rice, replace the lid and bake for 30-35 minutes or until the rice is cooked. 3. 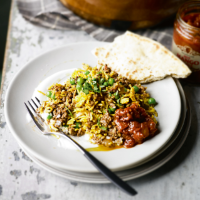 Sprinkle over the remaining coriander and serve with Waitrose naan bread and hot mango pickle.